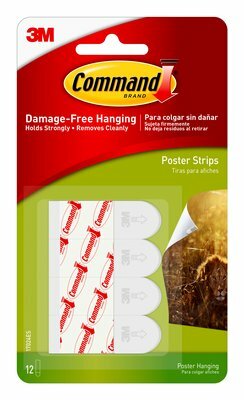 Command™ Poster Strips is rated 4.8 out of 5 by 191. Rated 5 out of 5 by JennJenn77 from Not a scratch, peel, or mark on the paint We just moved into a new house and I wanted to put up some posters for our Daugher's room. We just painted so we didn't want to mark the walls with regular tape, I found these at the store Command Poster strips. so easy to use and when we needed to take the poster down, came off without a hitch, no scratches, peels, or mark on the paint. definite buy again! Rated 5 out of 5 by Terry B from Simple, non marring Used simple poster hangers to “try out” different areas to hang a new piece or artwork. I could put it up for a few days, then move it to another spot till we found the perfect place. All without marring up the wall. Rated 5 out of 5 by jackie2005 from Poster Strips I'm really glad that I bought these. These poster strips work great. Bought these command strips so I could hang some soundproof foam on my walls as well as some posters. The command strips are holding my soundproof foam and posters very well and I have not had any issues with any of the command strips coming loose. Rated 5 out of 5 by NEW1234 from Well Worth the Money Easy on, easy off, with no damage. These strips are great for hanging my grandsons art work. Command products are #1!! 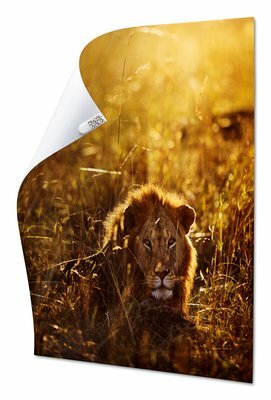 Rated 4 out of 5 by Ericky from Fantastic Product I just bought a house and needed remove my posters. I used this product and they worked fantastic. They came off clean and easy. Rated 5 out of 5 by amli from removes clean Holds strong on smooth surfaces and removes clean. Rated 5 out of 5 by CraftyMommy from Came off clean Needed to hang up my sons Minecraft poster. When time came to relocate the poster, the strips came off clean from poster and wall. Rated 1 out of 5 by KDB24 from Garbage Hung up 15 posters with an abundance or strpis as 4 was not nearly enough. About a week later Ive noticed all my posters are coming off the wall. I decided to laminate my posters so I started to remove the strips and the only thing they can accomplish is sticking to the poster and ruining your poster when you try to take them off.